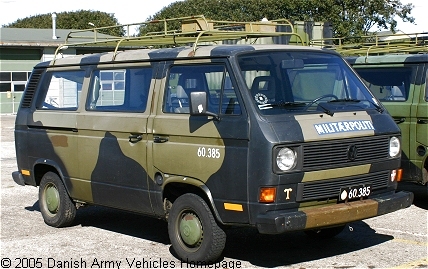 Danish Army Specific: Here shown is a VW M255 about 1990. Length: 4.27 m (166 inches). Width: 1.85 m (72 inches). Height: 1.97 m (76 inches). Weight: 2.450 kg (5.390 lb.). Fuel capacity: 60 liter (13 gallons). Range: 325 km (203 miles). Additional: The shown vehicle is used by the Military Police, and is mounted with a VHF-radio set. The antenna-bases can seen at the front of the roof-rack. Acquisition price in 1981 was around 65.000,- DKr.